The other day, I wrote about how my boss where I freelance bought me and another coworker Switches because we need them for our jobs. Ten-year-old me would still be losing his mind; I’m managing to keep it together, at least nominally. The hardest part about getting a new console that already has dozens of games on it that I want to play is deciding what to play first. Do I try setting up Smash Ultimate tournaments out my apartment? Do I finally dive into Stardew Valley, after reading about it for years? Reality came knocking while I was wondering about this. The first game I ended up downloading was actually Travis Strikes Again: No More Heroes because my boss was completing it for the show and wanted me to write the script with him; work comes first, even when work is games. Next I finally picked up Into the Breach because I love tactics and I love robots; super glad I did. I’ve dabbled in Smash and honestly, I’m not having an amazing time with it. It’s SO MUCH LESS fun when you’re playing by yourself that I haven’t even unlocked the entire roster after having the game for over a month. Being thirty years old with two part-time jobs means that your friends are in the same boat, and it’s just plain difficult to line up time to Smash, much less enough time to get to the same level I was at with Melee in high school and college. Which leads me to The Legend of Zelda: Breath of the Wild. One of “system sellers” of Nintendo’s latest console. I’ve read thinkpieces and listened to podcasts and wondered about this massive game, but had never actually played it myself. I had been keeping an eye on the Kinja deals page and had seen the game go on sale a few times but never pulled the trigger. Possibly because first-party Nintendo games rarely go on sale for less than $50, possibly because I was nervous about a game of that size taking up all my time. And then, Target price matching happened. They had some kind of online sale for BOTW for $45, and next thing I knew I was at my local Target showing the customer service lady my phone and having her make adjustments to the price of the game. I hemmed and hawed and debated returning it until I finally started playing. Everyone on this website with a Switch has undoubtedly played this game already. Maybe someday I’ll write something more substantial about the design elements or whatever. All I want to say right now is that this game has absolutely lived up to the years-long hype I’ve been hearing about. 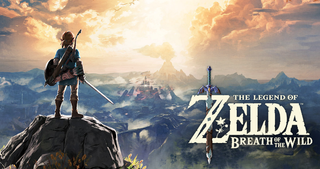 It’s massive, it’s difficult, it’s innovative, it doesn’t hold your hand in any significant way, it’s gorgeous, and Zelda’s voice actor is indeed jarring to listen to. OK, so maybe not everything blew me away. I’ll take the easy shot if it’s right there. I love that after I got off the Great Plateau, the game said “go here for more information- or not!” and just let me off the leash. I’m wandering around the world getting absolutely wrecked by Moblins five times bigger than Link, improvising strategies on the fly because my arrows are too weak to kill anything large. I’m climbing up the highest mountains I can with my (very) limited stamina, and leaping off the peaks to glide somewhere new. I’m JUMPING. With THE PRESS OF A BUTTON. Whenever I talk about video games with my wife, I always mention that there’s a special magic to a first-party Nintendo game but that it’s difficult to explain why; you just have to play them. We recently played Kirby Super Star together and she fell in love with Kirby, and I think she understood a little bit of what I was talking about. Zelda games in particular have a magic all their own, and this one is extremely special. I’ve had a few plot and mechanics things spoiled for me, which, hey, it’s part of the territory of working in or adjacent to the games industry. So far, that hasn’t ruined the experience and if anything has set up something else interesting. Link was caught in a lightning storm and I noticed his sword starting to spark up and I realized OH DANG IT’S HAPPENING and switched to something wooden before the lightning struck. But I didn’t know about how the rocks got slippery in the rain, making climbing much more dangerous. For every big thing I know about, there are fifteen smaller things that surprise and delight me. I love Breath of the Wild. I love my Switch. I’ll definitely be writing more about this game.